"Prepare yourself, really ugly crying happened!" Laci Ping wrote on Facebook about being reunited with her kitty. "This is the best feeling I've had in a LONG awhile!" 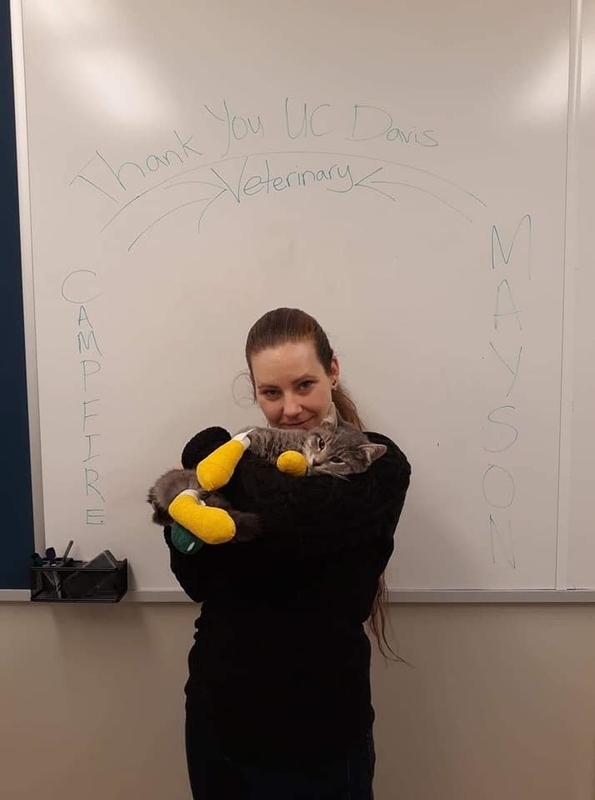 Mayson, a gray tabby kitty, was adopted by Laci Ping and her husband Curtis Mullins just two weeks before a fire swept through Paradise, California, destroying most of the community. In the chaos, Mayson escaped from his carrier as they got into a neighbor's car to flee the fire. On Saturday, Ping had a tearful reunion with her baby tabby at the UC Davis School of Veterinary Medicine, after first spotting Mayson in a photo album on Facebook that the animal hospital had set up to help owners identify their missing pets. 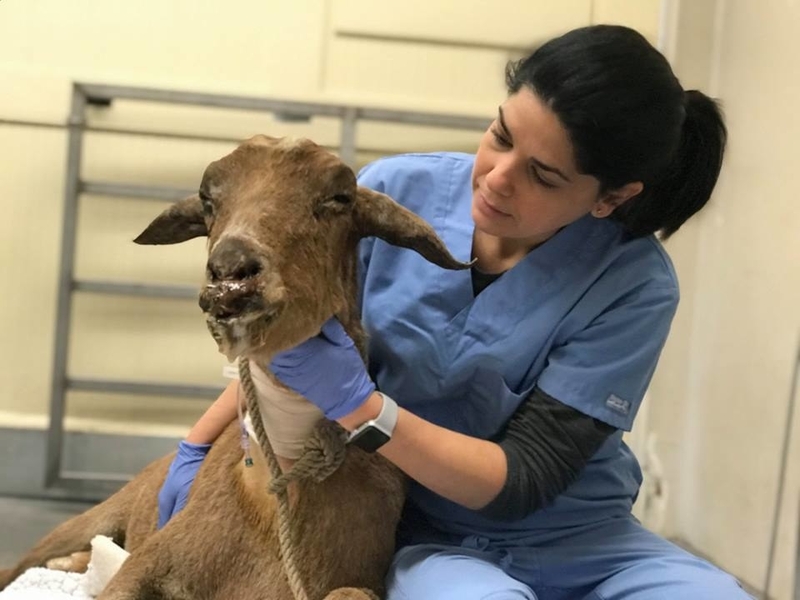 "That was a miracle," UC Davis School of Veterinary Medicine communications officer Trina Wood said to BuzzFeed News about the reunion. The process of reuniting pets with their owners is "like trying to find a needle in haystack," she added. "Mayson was one of the first ones we were able to connect the dots," said Wood. "That was one of the best reunion videos ever. I watched it over and over." "Prepare yourself, really ugly crying happened!" Laci Ping wrote on Facebook about being reunited with her cat. "This is the best feeling I've had in a LONG awhile!" More than 151,000 acres have burned and 12,200 structures have been destroyed by the Camp fire since it started on Nov. 8. The fast-moving blaze killed at least 79 people and another 699 are still missing. In the aftermath of the fires, thousands of humans as well as animals have lost their homes and been displaced. The North Valley Animal Disaster Group posted on Facebook that it has 1,798 pets in its emergency shelters. 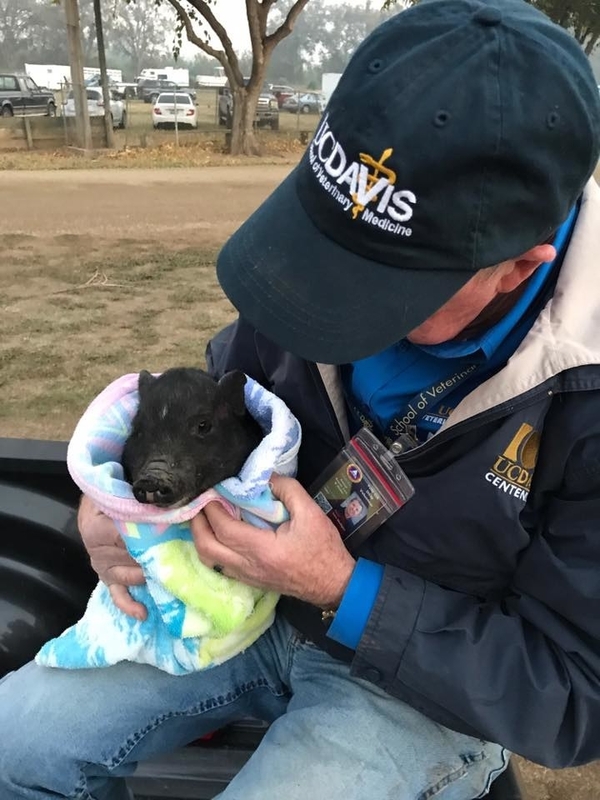 Wood said that the UC Davis School of Veterinary Medicine is currently taking care of eight goats, two pigs, a mini horse, three horses, a llama, five chickens, one duck, one goose, and 29 cats. "The number of animals that need help right now is pretty overwhelming," added Wood. This "chunky boy" is another cat being cared for at UC Davis School of Veterinary Medicine and will hopefully soon be reunited with its human too. 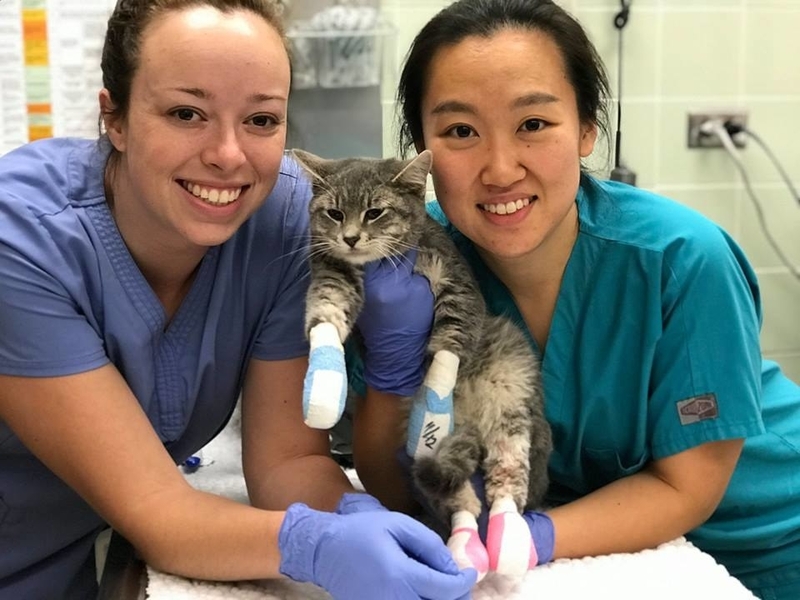 "Most of the cats have burnt paws," said Wood about the rescued pets that have arrived at UC Davis's veterinarian clinic. "They often have singed whiskers, burns to their ears, to their faces. Some of them have smoke inhalation as well." She said that many of the pigs had burns on their bellies and faces, because they are close to the ground, and the goats also had severe burns to their faces as they kept their heads close to the ground in order to find their way to safety. "A lot of singed fur and hooves," she added. 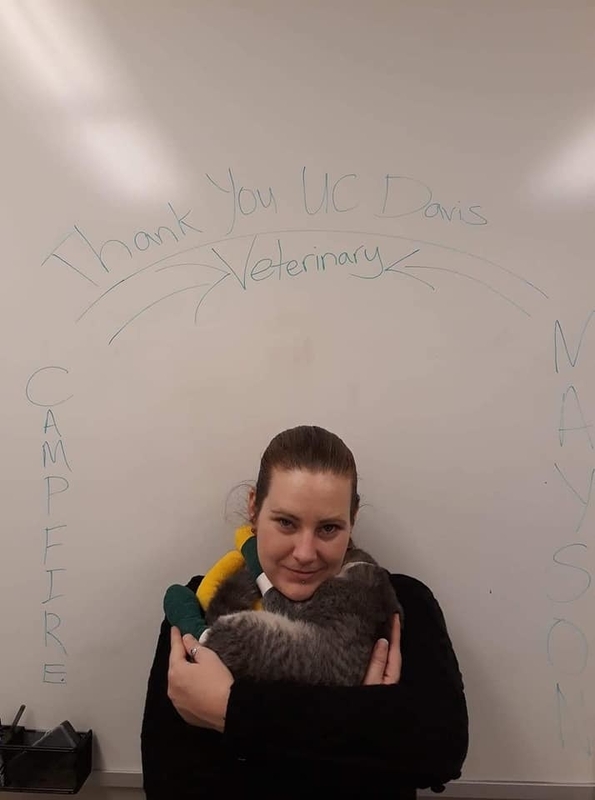 Wood and two of her colleagues have been working around the clock to go through the hundreds of emails that have been sent in response to the Facebook album of "unclaimed pets" that the UC Davis animal hospital created in hopes of reuniting owners and animals. "People are sending in photos of their cats, if they have photos, or they're simply saying 'I think so-and-so looks a lot like my cat' and giving us characteristics that we've been trying to match," said Wood. "We have recently made some really good connections that make all the long hours really worthwhile." Wood said that they have been able to find owners for most of the equine and livestock animals and nearly a dozen cats, who will be able to take their pets and farm animals once they have recovered. Still, she warned that some owners may have died in the fire. "We do have a few [pets] that we know were found in homes that were burned down," said Wood. Robin is another cat reunited with its family over the weekend. "The mom had called me and said it belonged to her 12-year-old son," said Wood. She said the boy, named Isaiah, "had saved all of his money for quite a while, because he really desperately wanted cats" and that his mom had "made him be responsible for the adoption fees, for the food, the setup, and everything." Wood said the reunion was extremely joyful, especially because the family lost everything in the fire, but they are still searching for Robin's brother, named Batman, who was also lost when they were fleeing the blaze. 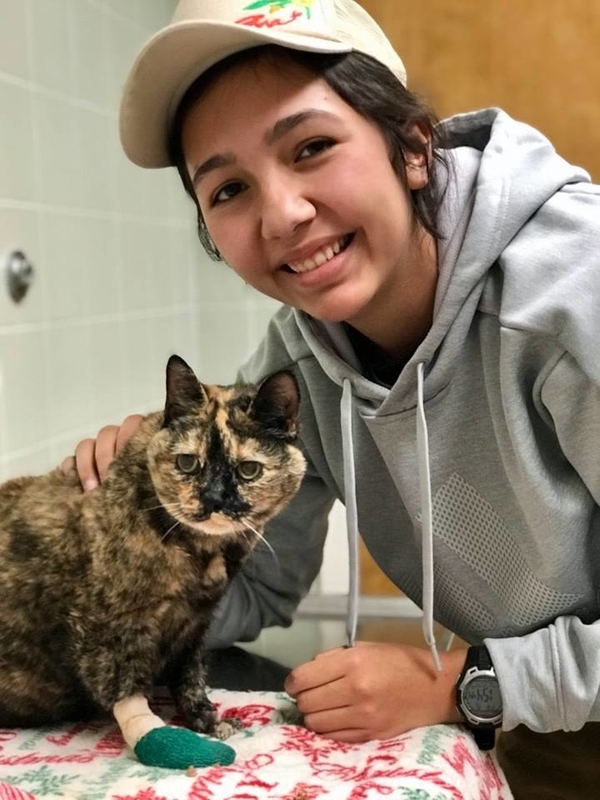 Coco, a Calico cat, was also reunited with her human, Baylee Danz, after she was spotted in the Facebook album posted by UC Davis's animal hospital. On the left is the picture that was first seen online by Baylee Danz, which helped her reunite with Coco, as seen in the photo on the right. Wood said that Danz grew up with Coco for the last 16 years, so the reunion was a huge relief for her. 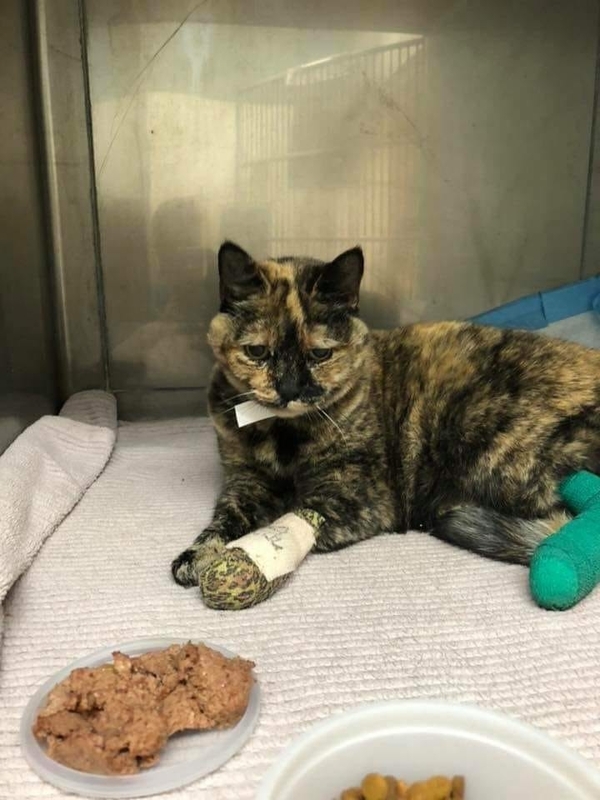 Coco still has another week of recovery before her final bandage will be removed, and then she can go home with her owner. "She is one of the favorites," added Wood, saying she's getting lots of attention from all the employees. "She's super loving and she'll purr." 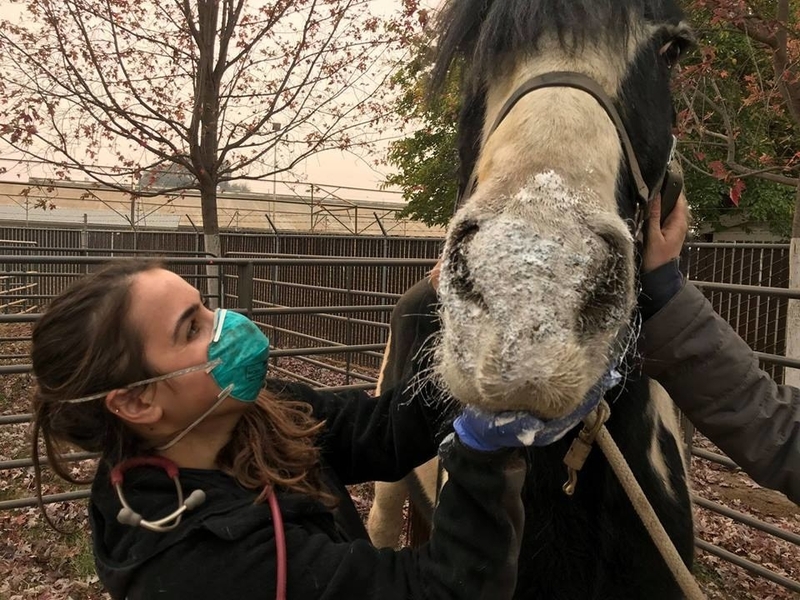 Wood said that they are still working to reunite the rest of the animals with their owners, but that she has been "blown away" by the power that sharing the Facebook album of "Unclaimed pets from the Camp fire" has had in finding owners.